Flexmar Coatings (New Kensington, PA) has introduced a new line of polyaspartic coatings made for interior and exterior commercial, residential and light industrial concrete floor substrates, the company says. The NextGen polyaspartic coatings line makes same-day application and return to service possible, according to Flexmar. Specifically, the system boasts a 25-minute working open time with a rapid 1-hour re-coat and 1- to 2-hour return-to-service interval, the company says. Re-coat and return-to-service times remain consistent in ambient temperatures ranging from 0 to 100 degrees Fahrenheit and relative humidity up to 85 percent, according to the company. The NextGen system is billed as durable, capable of applications in environments with high foot or vehicle traffic. 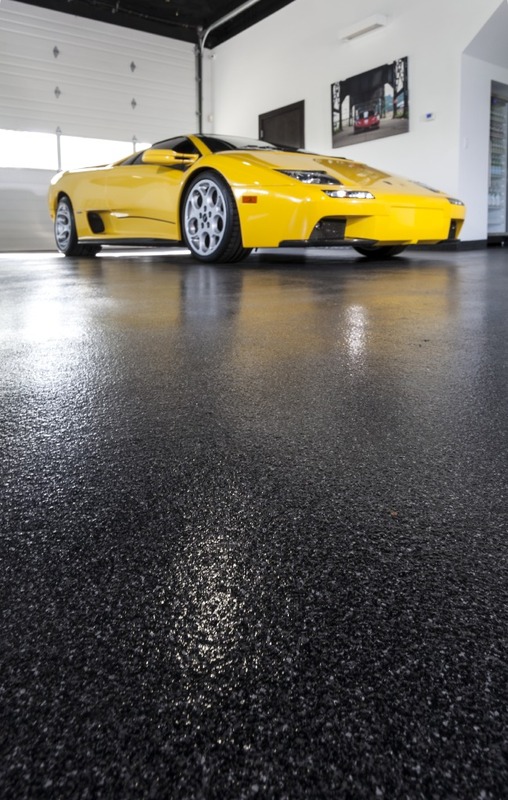 Flexmar NextGen custom-color vinyl chip polyaspartic coatings system was applied in the showroom of Forza Motorcars in Lower Burrell, PA. Installation was done by Todd Slomka and Kevin Bertocki of U-NEEK Concrete Coatings in Tarentum, PA. The zero-VOC, two-component line features factory-pigmented Flexmar NextGen Self-Prime HS color coats, Flexmar NextGen Clear Coat HS clear polyaspartic sealers and Flexmar NextGen Variegate HS polyaspartic stain-sealers. They are combined along with decorative media and micro-media slip reduction agents to a durable and stain resistant finish, according to the manufacturer. The company says the system is recommended for use in tight construction and renovation schedules, where the need to minimize revenue loss in retail settings, or the mission-critical nature of the floor surface for essential services like hospitals and medical facilities, fire and ambulance stations, schools and higher education facilities, airplane hangars and others. Flexmar adds that the system has virtually no odor and can contribute toward satisfying LEED credits in the Indoor Environmental Quality category.